One of the most basic and common security measures that you can adopt in your working environment is to protect your computer by automatically locking the screen after a certain period of inactivity, so that it is necessary to enter a password to unlock. 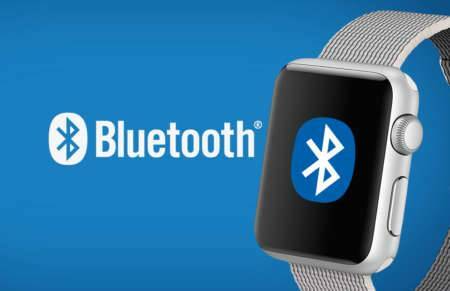 But there is a more effective way, and that is to configure your Linux machine so that the distance or proximity of a Bluetooth device you own, for example your cell phone or a smartwatch, automatically causes locking or unlocking the screen without having to enter any password on keyboard. In an ideal world you would always remember to lock the screen when you leave your workplace to prevent another person from manipulating your computer during your absence. However, sometimes it will happen that you will neglect and forget to do so, compromising your information security. But even though you always remember to lock the screen, unlocking it regularly over and over again in the presence of other people or in uncontrolled environments is also a major security risk, as you will be exposing your password every time you type it, either because someone next to you sees you writing it or because a surveillance camera records the password you enter on your keyboard. Thus, with the solution I propose here you will minimize both risks: forgetting about manually lock the screen and exposing your password every time you type it. 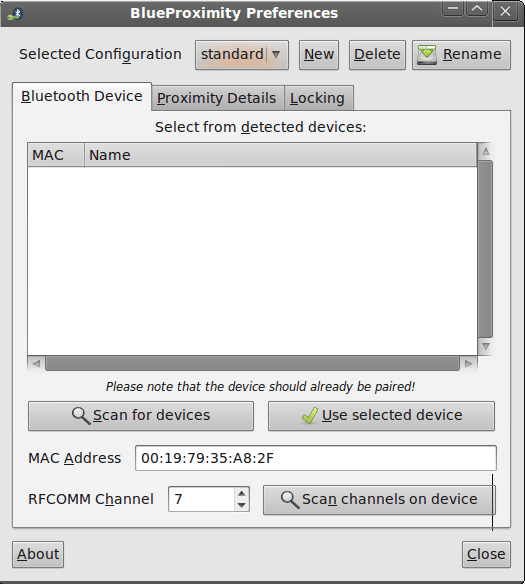 Blueproximity is an application that constantly monitors signal strength of a Bluetooth device linked to your computer, so that if you move away from your workplace carrying your smartphone and the signal strength falls below a given threshold for a given period of time (both parameters can be configured as you like), a command of your choice will run, normally one whose purpose is to lock the screen. Otherwise, when the signal level recovers because you get closer to the computer, the screen unlock command will be executed without you having to do anything. 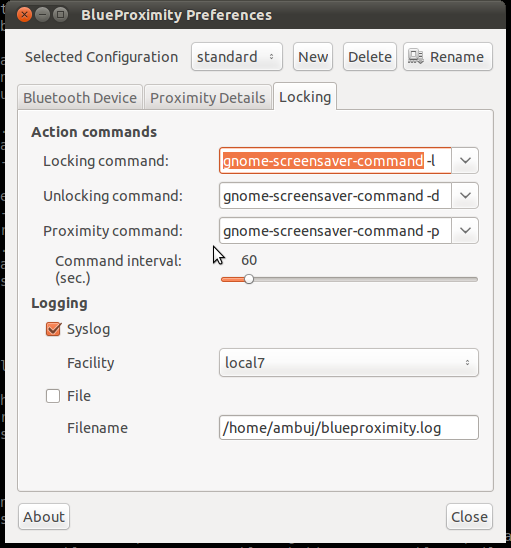 Once installed the blueproximity package you will have to proceed to link your Bluetooth device to your computer, configure the thresholds for the signal strength level and set the locking and unlocking commands that best fit your desktop environment and the goals you want to achieve. Next follow up the most common locking/unlocking commands according to the graphical environment you work with. 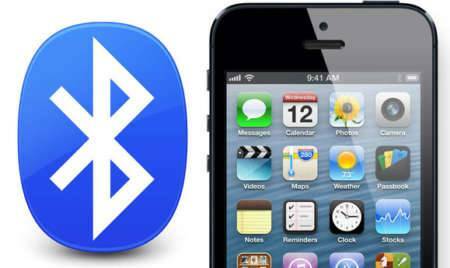 The third command in the configuration dialog box (Proximity command) runs periodically according to the selected time interval as long as your Bluetooth device is within range. This can be used to run a command that simulates user activity so that the session will never be locked even if there is no user activity but you are nearby. You can use here just the same command as for unlocking. In this case there are two commands because the second one corresponds to older versions of KDE prior to version 4.13. If your computer has a physical button to enable or disable Bluetooth then it is the Hard blocked parameter which could be set to yes. loginctl lock-session && pb push "Screen locked at $(date +%H:%M:%S) on $(date +%d/%m/%Y)"
loginctl lock-session && purple-remote "setstatus?status=away&message=No disponible"
If you can think of more examples do not hesitate to make your contribution by writing a comment! Entrepreneur, a generator of ideas and restless mind. Passionate about new technologies, especially Linux systems and Open Source Software. I also like to write about Technology News, Cloud Computing, DevOps, System Security, Web Development and Programming, SEO, Science, Innovation, Entrepreneurship, etc. Sounds nice and easy, will try it immediately. My problem, I have two-three persons (nurses) working on the same workstation. Is there a way of unlocking the system if any of a (certain number of) smartphones or other BT devices are present at the WS?. Sure! That’s the point of applications like Blueproximity. Does this use bluetooth LE or just regular bluetooth? 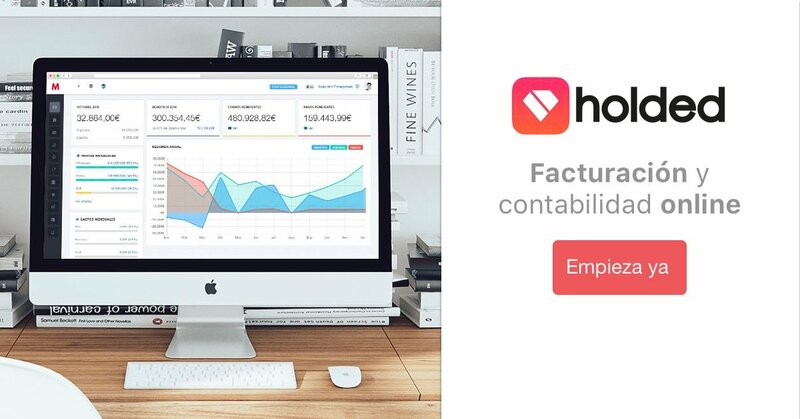 Both of them, Blueproximity is only a piece of software that works independently on top of hardware devices connected to your system, which can be LE or not.